Since the collapse of the Soviet Union, Russia's army has undergone a turbulent transformation: from the scattered leftovers of the old Soviet military, through a period of shocking decay and demoralization, to the disciplined force and sophisticated “hybrid war” doctrine that enabled Vladimir Putin to seize Crimea virtually overnight in 2014. Using rare photographs and full-color images of the army in action, profiles of army leaders and defense ministers, as well as orders of battle and details of equipment and dress, this is a vivid account of the army's troubled history and of its current character, capabilities and status. Professor Mark Galeotti is Clinical Professor of Global Affairs at New York University. He is a former foreign office advisor on Russian security affairs, and for fifteen years wrote a monthly column for Jane's Intelligence Review. 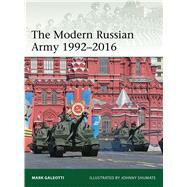 Mark's most recent books for Osprey are Russian Security and Paramilitary Forces since 1991 and Spetsnaz. Johnny Shumate works as a freelance illustrator in Nashville, Tennessee. He graduated in 1987 from Austin Peay State University.